A decade ago, director-screenwriter Bryan Bertino channeled the Manson family murders and Straw Dogs to conjure up The Strangers, a nihilistic examination of the random violence visited upon a young couple in a rural home by three masked strangers. It’s a film of extreme brutality, and I’ve only ever been able to stomach it one time. Now, 47 Meters Down director Johannes Roberts has brought it all back with The Strangers: Prey at Night, a soft reboot/quasi-sequel which replaces the black heart of the original with a heaping dose of 80s slasher homages. As Roberts told Shock Waves, his goal was for Prey at Night to be the John Carpenter movie he’s always wanted to make. Yeahhhh….Carpenter would have made something much better than this. A Prey at Night publicity still. The killers never actually share the screen together like this in the movie. To be fair, Roberts honors all of that in Prey at Night and adds an extra layer of Grindhouse, but he’s also a guy who got into filmmaking simply because he loved Carpenter and Stephen King. So, he overlays a Dead Zone-like front onto the opening title card, sprinkles 80s pop on the soundtrack, and drops a synth-laden musical score that sounds like It Follows and Strangers Things had a demented baby. Moreover, he leans pretty hard into some overused slasher tropes, such as actively encouraging audiences to talk back at the screen and mock the idiocy of the characters who display no survival instincts and keep making the same mistakes. That makes Prey at Night fun to see with a packed audience of engaged horror fans, which is entirely why I went to see it: I was jonesing for the high of experiencing a horror movie with a big crowd. Also, Roberts’ Shock Waves interview endeared him to me, particularly the Kevin Smith-esque, DIY story about him making his first movie at just 21 for five grand on a maxed out credit card and little clue what he was doing (e.g., didn’t hire a first AD because he didn’t know that was a thing). But I ended up enjoying the crowd’s responses to Prey at Night far more than the actual movie. The plot, thin as it is, involves a family of four traveling to a relative’s trailer park to spend the night. The teen daughter in the family, Kinsey (Bailee Madison, looking a fair bit like a Jessica Jones cosplayer), is being sent away to boarding school after a year full of ill-defined indiscretions. 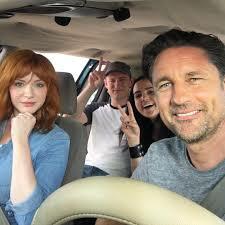 The mother (Christina Hendricks) and father (Martin Henderson) disagree over whether this is the right thing for her while the older brother (Lewis Pullman) simply doesn’t understand why he even has to be on this trip with them since he’s beyond old enough to say home by himself. But they want him there to support his sister, and the trailer park stay is just a temporary stop on the way to her new boarding school. Except, and this shouldn’t be too big of a spoiler, they never make it to that boarding school. Within minutes of arriving at the trailer, a mysterious teen girl arrives at their door asking if Tamara is there, a callback to the first film. She quickly departs before they ever get a good look at her face, and her arrival signals the start of a stalk-and-kill routine which plays out to the increasing bewilderment of our clueless protagonists. It’s a run-for-your-life, survive-the-night exercise in empty-headed adrenaline, and it wasn’t too long before the people around me started laughing at and sometimes with the movie. Hendrick’s over-the-top scream of “Just leave us alone!” seemed to get the ball rolling, and from that point forward it was a back and forth between laughing in mockery and laughing at ourselves on those rare instances where the film actually scared us. As anyone who has seen 47 Meters Down knows, Roberts knows his way around a jump scare, and there are several good ones in Prey at Night. Plus, half the job in a movie like this is making sure the masks are creepy, and, really, bravo. We are currently living through a golden age of horror, a period where the increasing terror of the real world has directly fed the hunger for movies which can speak to our anxieties through metaphor and primal fear. It’s thus also a golden age for not only telling people if a certain movie is good but also what the movie is really about. However, I feel comfortable in telling you this: Prey at Night isn’t about anything other than three people hunting a family for shits and giggles. There’s no deeper meaning here. It’s just a simple slasher flick, one which is neither as campy as the Jasons and Freddys of old nor as sadistic as the original Strangers or anything Eli Roth’s made. If you can see Prey at Night with a big group of horror fans who don’t expect anything more than cheap scares, bad acting, and scary masks don’t pass up the opportunity; if not, though, then stay the heck away from this movie. While Prey at Night’s American Psycho-esque use of 80s pop plays a tad too familiar, it also results in the best use of “Total Eclipse of the Heart” I’ve ever seen. Roberts told Shock Waves he’s not actually a huge fan of home invasion horror, which is probably why Prey at Night widens the scope of the original Strangers to encompass an entire trailer park instead of a single home. This at least frees the movie up to repeatedly change the setting, with the family cycling through various homes inside the trailer park instead of staying in just the one spot. Previous Entry Film Review: David Oyelowo Is a Revelation in Gringo. Too Bad the Movie Is So Muddled.